The beginning of 2017 was very busy for the Club, with events ranging from very small, to small, to large—and the response has grown consistently, both in numbers and in Columbia spirit. Many thanks for all of you who made the time to attend—and those who are fast becoming pillars of our community (you know who you are). We couldn't do this without you showing up! March will be no exception, with possibly the most exciting lineup of events the CUCL has ever had (OK, outside of the 250th Anniversary celebrations in 2004 —that is VERY hard to beat), with a Quiz Night, a FinTech event, and our first walking tour of Soho. We look forward to meeting you at one (or all!) of our events in March! On January 23rd, we convened our new CUCL board meeting. 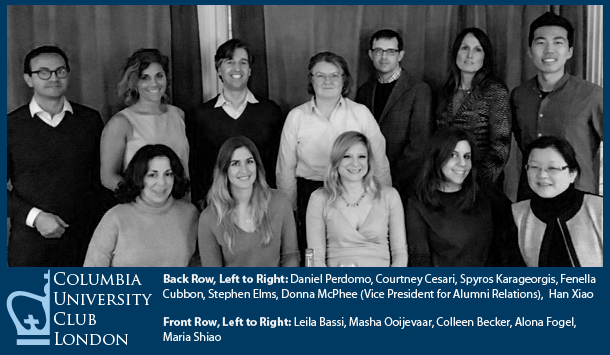 This is a group of hugely talented and diverse alumni, hailing from 8 different schools, and committed to grow a strong Columbia community in London and the UK. In addition to some critical administrative, governance and financial issues that required our attention, the focus of our meeting was to define the priorities to achieve a strong level of alumni engagement. We discussed our calendar of activities and programs, volunteering opportunities (stay tuned), and preparing for Columbia Connects and the leadership handover in the fall. Maria Shiao (SEAS '86) has been on the CUCL Board since its creation in 2004. She has most recently been leading the Columbia Venture Community and CAA Arts Access initiatives in London. 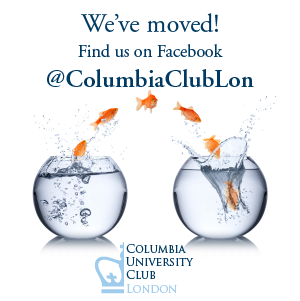 Before moving to London, she was the Founding President of the Columbia Alumni Club of Paris (2001-2004), and has been an ARC member or chair in Paris, Brussels, and London. Maria received the Columbia Alumni Medal for Distinguished Service in 2010. Maria is a tech entrepreneur, angel investor and advisor to startups and their growth ecosystem. 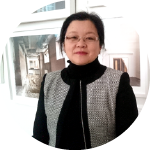 She works across many technologies but now focuses on IoT and Smart Cities (hardware, SaaS, analytics/AI). Prior to her startup life, she had a successful corporate career with leading global telecoms and IT companies. A native of Spain, Maria has lived in the US, France, Belgium and for the last 12 years, in the UK. In addition to her BS (Hons) in Electrical Engineering from Columbia, she holds a MSEE from Telecom ParisTech and an MBA (Hons) from ESSEC Paris. Stephen holds a MFA in producing and theatre management from Columbia University’s School of the Arts (2008). 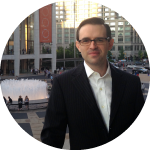 In the summer of 2015, he relocated from New York City to open the 87AM London office as the Senior Account Director. While with 87AM, he spearheaded the successful launch of the digital campaign for Disney’s “Aladdin” in the West End. Stephen holds a BFA in lighting design from the School of Design and Production at University of North Carolina School of the Arts. Professor Jose Antonio Ocampo was visiting London the week of the 13th Jan to moderate a panel at the London School of Economics in the conference entitled “Fourth Annual CAF-LSE Global South Conference”. Professor Ocampo with a group of Columbia alumni had dinner at the Caledonian Club where an intimate conversation happened about the role of development banks in a globalized world and also about the current financial crisis. 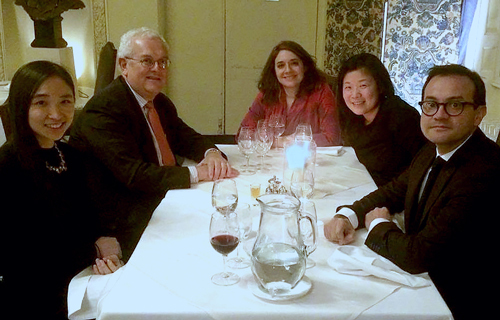 The Columbia alumni pictured with Prof. Ocampo; Di Fu, Jiahui Shen, Juanita Gonzalez-Uribe, and Daniel Perdomo-Rodriguez. WeWork SoHo hosted us for a great evening of Columbia news and discussion, ranging from the new Manhattanville Campus to our Global Centers, and with surprise alumni guests from as far away as New York and Boston!! We were happy to have a full house and left feeling good and proud to be part of the Columbia global community. Many thanks to Donna and Jaclyn for visiting from New York and bringing us all together! Our monthly Happy Hour gets shifted by one day, as by popular demand we join the US Alumni Club in London for their Quiz Night. Get ready for fierce competition between eleven US university clubs, all vying to beat the title holder, Dartmouth. The CUCL team of eight has been selected but they need your support. Sign up HERE as a cheerleader for £10 which includes one drink and appetizers. RSVP: Cheerleader £10 ticket includes 1 drink and appetizers Purchase tickets HERE. The Fintech series of events convened by Balliol Knowledge Networks in collaboration with the Columbia University Club of London and the Harvard Club of the United Kingdom. This will be the start of on ongoing speaker series bringing thought provoking events on business and technology trends.